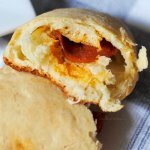 West Virginia Pepperoni Rolls are warm, flaky, and stuffed with spicy pepperoni and cheese. You've got to try them to see why they're famous here! Combine yeast and warm water in a large mixing bowl. Leave for 5 minutes until you see foaming action. Water that's too hot will kill the yeast (you can tell because there will be no foam). Stir in melted butter, salt, sugar, and eggs. Slowly incorporate flour, one cup at a time, until all four cups are mixed into the dough. The dough should be sticky and hard to stir. Cover bowl and refrigerate for at least two hours. Spread a generous amount of flour on counter or large cutting board. Knead dough on the counter to work in a bit more flour, until the dough is not so sticky. Cut dough in half evenly, the cut each of those halves in half again. Repeat until you have 18 rolls. Roll each ball of dough, then flatten until about 1/2 inch thick. The diameter should be about the size of the palm of your hand. Place cheese and pepperoni on one side, then roll. Pinch ends to seal. Lay pepperoni rolls on a cookie sheet covered with a non-stick silicone baking mat, about 6 per tray. Cover each tray with a dish towel and let rise 45 minutes - 1 hour. Before baking, brush the rolls with melted butter. Bake for 18 minutes at 375°F.